A site at the flatiron corner of Market, Church, and 14th Streets where a single story restaurant space has been vacant since 2011 — save for squatters, lots of squatters — was active with construction workers yesterday as they prepared to perform foundation tests. That's right: The site will finally give way to a long-planned, repeatedly delayed development of a 60-unit, seven-story building from developer Brian Spiers. Last fall, Spiers indicated that, "optimistically....we could potentially start late this year or first quarter next year." His second guess was right, as Spiers now tells Hoodline that demolition starts next month with preparations already in the works. Per Hoodline, neighbors near the intersection were told over the weekend to expect noise at the job site starting this Thursday. That "construction related noise" won't yet be construction: "The activity on site now are just for a couple of test piles for foundation engineering purposes," Spiers told Hoodline. "This should only take a couple of days." 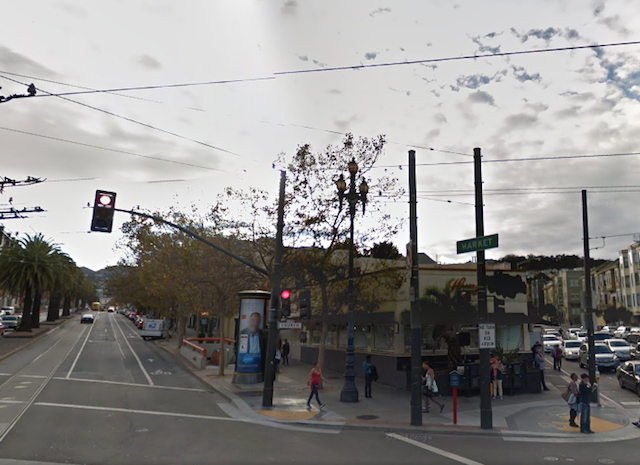 Redesigned several times over, the development, whose address is 2100 Market Street, calls for 60 apartments, down slightly from a previous design, and according to plans obtained by Socketsite those are a mix of studios (6), one-bedrooms (30) and two bedroom (24). Once demolition of the former Home is complete, the building is expected to take 20 months to complete, putting us in fall of 2018. Two restaurant/retail spaces have been allotted 4,100 total square feet on the ground floor, plus interior storage for bikes, but notably, no car parking — a sore spot with some neighbors who have been vocal in their worries about traffic, street parking, and the like. FYI, don't expect a Chipotle in either of those retail spaces. In 2013, neighbors fought hard against the chain renovating and opening in the Home space on formula-retail grounds. The project at the site is one of three remaining developable sites in the environs. There are also condos bound for the site of Sullivan's funeral home, and the development of the ARCO gas station, much delayed, is still in the pipeline at Castro and Market.Brian Spiers Development is also behind two other Market Street projects, 1998 Market Street and 1600 Market Street. A pedestrian who fell down while crossing the street was seriously injured Tuesday, when a driver ran him over as he lay on the ground. The collision happened at 4:20 p.m.